The Broin family breathes life back into a failed ethanol plant. With its 1.7 billion gallon annual production – enough ethanol to fill 2,600 Olympic swimming pools, float seven aircraft carrier hulls or create similarly incomprehensibly mammoth measures – POET is among the world’s preeminent ethanol producers. It is also a driving force in advancing the science and technology of biofuels. POET’s history gives insight into how it got where it is today. The company’s genetic code features agile learning, meticulous planning, an unblinking eye on efficiency and quality and excellent timing. But a final attribute is the lifeline that allowed POET to leverage all those advantages, and it goes all the way back to the earliest days of the Broin family in Scotland, SD. POET’s founders put their family legacy on the line to bring their vision for a renewable fuels industry to reality. Throughout the 1980s, ethanol was still licking its wounds as the first generation of production facilities had fallen victim to unfavorable markets, costly and inefficient fermenting and production processes and failed management. “It had come out of the 1980s beat up and bloody. The whole industry had a lot of potential. But it wasn’t quite there,” remembers Dennis Everson. He is a member of First Dakota National Bank’s board of directors and was formerly president and manager of the bank’s agri-business division. In 1987, in this uncertain environment, Lowell Broin and his sons Rob and Jeff partnered to buy a bankrupt ethanol plant in Scotland at an auction. Their plan was to bid on equipment that could be transported from South Dakota to an existing small plant on the Broin’s Minnesota dairy farm or, if the price was right, to acquire the entire Scotland operation. In a brochure announcing the auction, “the pictures made it look like a very nice facility,” Jeff recalls. “There were some scary times there knowing the farm was backing it up,” adds Rob. The auction photos advertising the plant flattered it. “A lot of stuff was in need of clean up and repair. It had been sitting there for six years,” says Rob. A bidder the Broins beat out for the shuttered plant had figured its best use was to scrap the equipment and use it as a corn storage facility. James Putnam, of Armour, SD, was a new member of the South Dakota House of Representatives when the Broins came to Scotland. Over the next 26 years, as a member of the House and Senate, he was a key legislative ally as the Broins sought to build a new renewable fuels industry. At 22, many people find themselves challenged to try something new. Jeff Broin took it to a new level. He was just out of college and beginning a career in banking as a loan officer when his family bought the Scotland ethanol plant. He was summoned home shortly after the auction for what he thought would be a weekend of work on the family farm. Instead, his parents presented a lifechanging proposition. Would he become general manager of the ethanol plant? “I was a young man, adventurous. I was willing to try anything once.” Rob, 27, soon followed him from Minnesota to South Dakota for a nine month stay to rebuild the plant after harvest concluded on the family farm. Based on their respective talents, Jeff pursued financing and business for the venture, as well as handling the politics. Rob, who had largely built and operated the family farm ethanol plant, took on the task of modifying and improving the equipment and the technology at the Scotland facility. “Nobody wanted to give us insurance,” Jeff recalls. “We couldn’t get bonding,” for the federal alcohol tax. “Everywhere we turned there was a roadblock to the next step.” A Nebraska creamery owner the Broins met at an auction provided $250,000 cash to back up the bond. Acquiring used equipment from other defunct ethanol plants, closed creameries and from the Schlitz Brewery in Milwaukee, WI that was going out of business, provided material for the needed reconstruction and eventual expansion of the Scotland plant. An unexpected spike in the corn price drained the Broins’ cash reserves and nearly derailed their venture just as it was getting under way. “We got a big scare, but it came back down,” says Rob of the corn price. And the distillers grains and thin stillage were sold to dozens of local and regional dairies and feedlots. It took time and perseverance to get the product sold so the plant could operate. The Broins’ dogged determination, and Jeff’s persuasiveness, helped them gain access to needed capital through local bank financing, a loan from the South Dakota Revolving Economic Development and Initiative fund and a 20-cent per gallon state incentive for ethanol. Having had bad experiences with past ethanol failures, legislators were skeptical about supporting the Broins with an economic development loan and incentives, Putnam says. But Jeff and legislative supporters like Putnam were able to get new Gov. George Mickelson behind the Broins’ venture. “The governor looked at the figures himself. He said ‘let’s run a bill and see what happens,’” Putnam said. Everson, at First Dakota, attests to Jeff Broin’s ability to make a compelling case for the Scotland plant. But how many borrowers are willing to back their belief with their family legacy? “You didn’t have to be around Jeff and Rob very long. Their enthusiasm was contagious,” says Everson. Frank Kloucek, a Scotland farmer who served in the South Dakota House and Senate from 1991 through 2012, was another supporter of the Broins’ efforts. Kloucek also says he got the first load of livestock feed, a byproduct of ethanol production, from the Scotland plant. Kloucek remembers the Broins had to annually overcome opposition to state funding for the decade they sought it. A vital, and expensive, centrifuge system disintegrated in the first few weeks of operation and needed to be replaced. 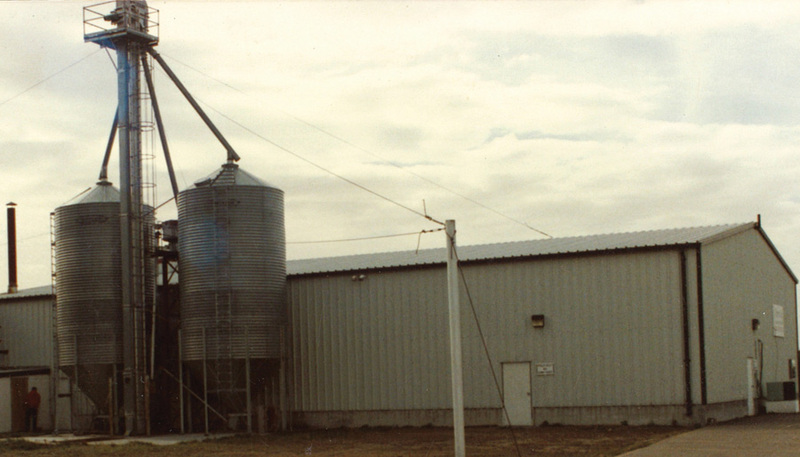 Rob had been instrumental in building the ethanol plant on the Broin farm. He gained valuable insight there. Rob returned to farming in Minnesota after the initial startup. Two years later, the decision was made to expand from one million to three million gallons per year, and Rob returned to Scotland permanently. In the months of reconstructing the original plant and subsequent years of expanding it, Rob remembers “we were just solving problems every day, finding ways to make things work better. Younger brother Todd Broin took a year off from college to work on the farm to support the venture, later moving to Scotland after college, first as a production manager, then to apply his computer science degree to develop computer control systems for the ethanol production process. It was an example of the drive toward efficiency that characterized the Broins’ success. At the urging of Steve Lewis, a fermentation specialist from Genencor who is now POET’s Vice President of Innovation, and Deb Roth, now Plant Research Lab Director at POET Research Center, the Broins leased a High Power Liquid Chromatograph. It was an expensive addition to an ethanol plant in that era, but it made the Scotland plant more efficient than its competitors. Rob chuckles. He had colorful memories of the original operations crew. From the original Scotland production facility, POET has grown to 28 plants. Jeff says “eventually we learned what was working at Scotland and that helped us.” The Broins branched out into building and managing ethanol plants through POET Plant Management. Divisions were added for marketing ethanol and coproducts, as well as a division for research. The Scotland plant has become POET Research Center. At Scotland now, state-of-the-art technology in biofuels production is developed and taken to commercial scale in the two pilot plants located there as well as the original plant, now 8 million gallons per year in capacity. “We have a lot of flexibility. No other company in the industry has the ability to do that scale of research the way we do. It’s a major strategic advantage for all of the POET plants,” says Jeff. The Broins’ decision to risk the legacy of the family farm to make ethanol in Scotland is the cornerstone of POET today. “What we started in Scotland led to a major impact on worldwide commodity and land prices,” says Jeff. “There were so many that played a role in this venture and we wouldn’t be here without them.